On 23rd February 1971 Melinda Messenger was born in Swindon, Wiltshire and this winter rally commemorates her birth and subsequent fame. 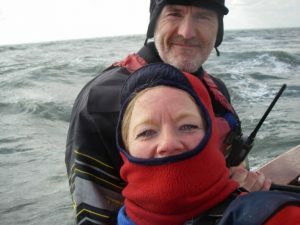 You are invited to celebrate Melinda’s birthday by joining me for an experience never to be forgotten – ‘life on the ocean wave’ – adventure, excitement and maybe a slight touch of cold, sailing at Brancaster Staithe in February 2019. 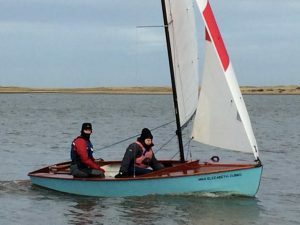 Bring your Wayfarer along to North Norfolk (PE31 8BW will get you there) so you can get it rigged up on Friday (or suffer the consequences of a very early start on Saturday morning). Accommodation is provided at the Bunkhouse at Burnham Deepdale. This luxury sleeping facility has been booked and paid for in advance for your convenience and has been found to be almost ideal in past years. 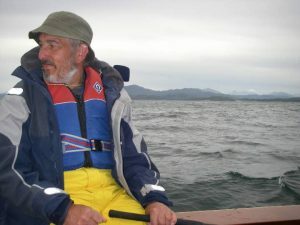 You do need to be suitably experienced and equipped as we may be sailing out to sea, but if in doubt give me a ring to discuss. You will of course need to know what to bring – it will probably be cold enough to keep a supermodel indoors! – so, many fleeces, hats, gloves and ‘base layer’ clothing to be worn. The motto will be ‘you can always take it off, but if you haven’t got it with you, then you can’t put it on’! It is also fairly certain that wetness will be a factor, so waterproof trousers and jackets will be worn as a minimum. Drysuits are preferred, wetsuits are not. For feet we recommend dinghy boots or wellies big enough to accommodate a thick sock or two. Safety is of course of importance as this sail is towards the extreme end of Wayfarer events – sustenance is of course supreme – eat lots and keep warm. High water is at 09.20hrs on Saturday and launch time will be around 07.10hrs so be prepared! A Friday evening meal is planned at the Bunkhouse and Saturday evening will see us enjoying a Chinese takeaway meal also at the Bunkhouse. Post-dinner refreshment will be in support of local pubs (walking distance). Lunches will be your responsibility and can be taken after sailing (but remember some food to keep you going on the water. You need to supply your own breakfasts and any particular delicacies you can provide will be readily shared amongst the group. You will definitely get some sleep during the weekend, duvets/sheets and pillowcases are provided by the establishment. There are two showers in the Bunkhouse so washing is a possibility. And here’s the rub – nothing these days is free, and this short but delightful break from the routine and drudgery of winter life is no exception. A £50.00 deposit per head will secure your place. I have already forked out for the accommodation, so ‘pay up early’ and please send your money to me before Christmas 2018. The final cost will depend on how many models decide to attend to share the cost of the event, but it’s unlikely to exceed £50.00 per person. Remember – as Melinda would I am sure say – style is important, but once at sea, there’s no-one out there to see you!